The word I drew from my word hoard for this stitch pattern is Myth, suggested by Nim on Patreon. I’ve made two coordinating versions of the stitch; the taller one is essentially the same as the shorter, just with the second repeat offset halfway horizontally. Each month, my Patreon backers have the chance to suggest words for me to encode as knitting stitches. I make two of these into knitting stitches each month: the first is drawn from the collection of new words; the second is drawn from the collection of unused words. A random number generator helps me choose thes, and then I get to work, first turning the letters into numbers, then charting the numbers onto grids in various ways. Finally, when I make the chart into lace, I turn the marked squares into yarnovers and work out where to place the corresponding decreases. 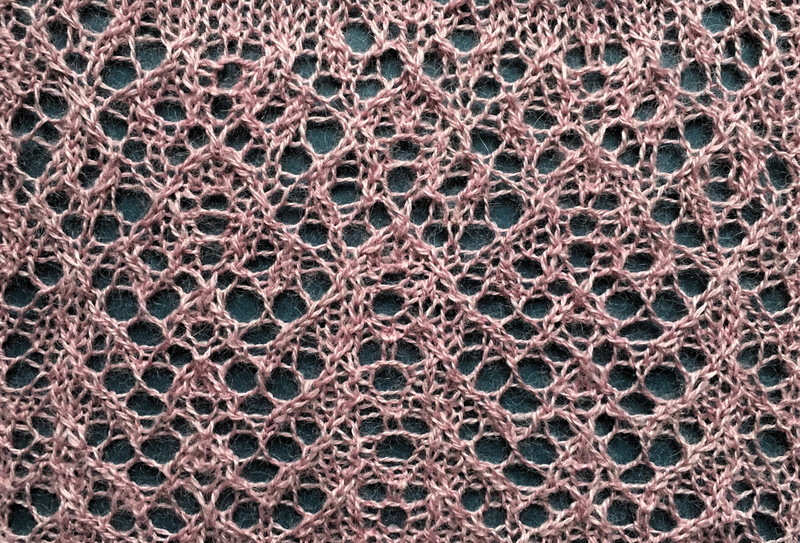 (I usually make lace; occasionally I make cables instead.) I also make a chart for any craft that uses a square grid for designing; this goes in a separate post. Myth is a multiple of 18+19 stitches. Version 1 is a multiple of 6 rows, while version 2 is a multiple of 12 rows. k1 tbl: knit 1 stitch through the back loop. Row 1 (RS): yo, (k1, k2tog) x 2, yo, k1 tbl, yo, ssk, *k1, k2tog, yo, k1 tbl, yo, ssk, k1, ssk, kyok, k2tog, k1, k2tog, yo, k1 tbl, yo, ssk; work from *, k1, k2tog, yo, k1 tbl, yo, (ssk, k1) x 2, yo. Row 3: k1, yo, k2tog x 2, yo, k3, yo, *cdd, yo, k3, yo, ssk x 2, yo, k1, yo, k2tog x 2, yo, k3, yo; work from *, cdd, yo, k3, yo, ssk x 2, yo, k1. Row 5: k2, 1/1 RC, k1, k2tog, yo, ssk, *kyok, k2tog, yo, ssk, k1, 1/1 LC, k3, 1/1 RC, k1, k2tog, yo, ssk; work from *, kyok, k2tog, yo, ssk, k1, 1/1 LC, k2. Row 1 (RS): yo, (k1, k2tog) x 2, yo, k1, yo, ssk, *k1, k2tog, yo, k1, yo, ssk, k1, ssk, kyok, k2tog, k1, k2tog, yo, k1, yo, ssk; work from *, k1, k2tog, yo, k1, yo, (ssk, k1) x 2, yo. Row 7: k1, k2tog, yo, k1, yo, ssk, k1, ssk, *kyok, k2tog, (k1, k2tog, yo, k1, yo, ssk) x 2, k1, ssk; work from *, kyok, k2tog, k1, k2tog, yo, k1, yo, ssk, k1. Row 9: k2tog, yo, k3, yo, ssk x 2, yo, *k1, yo, k2tog x 2, yo, k3, yo, cdd, yo, k3, yo, ssk x 2, yo; work from *, k1, yo, k2tog x 2, yo, k3, yo, ssk. Row 11: yo, k1, k2tog, yo, ssk, k1, 1/1 LC, k1, *k2, 1/1 RC, k1, k2tog, yo, ssk, kyok, k2tog, yo, ssk, k1, 1/1 LC, k1; work from *, k2, 1/1 RC, k1, k2tog, yo, ssk, k1, yo.